We introduced data slices concept in late 2011 and changed it to properly cover Wowza Media Server in early 2012. It was based on applications - you can define regular expression for application names and get the date gathered for specified app only. Application is the basic way to separate different streaming instances within Wowza, like different clients which have different VOD content or live streams. So each slice was a reflection of one or more applications and all the data we have for daily stats - like connections, traffic, bandwidth, geo-location, duration, billing - was collected using this basis. Right after we launched slices, people started asking if we plan making data slices based on stream names. Many people want to know the performance of individual streams rather than entire application. Streams reports were not enough in some cases. So we've been gathering this feedback and changing our infrastructure and processing algorithms to cover this upcoming approach. 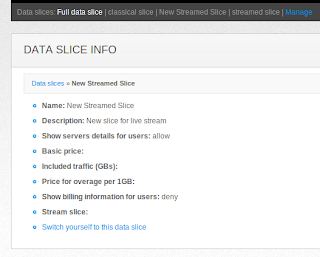 Now we introduce new stream-based data slices. This means that you can now create 2 kinds of slices - application-based and stream-based. Application slices has advanced include/exclude rules distinction while streams are a bit more simple. Let's see what it can do. 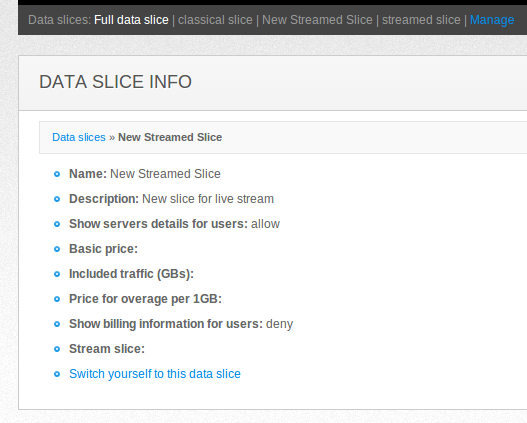 To create a slice you need to click on data slices Manage link and then click on Create streamed data slice. You will see a dialog asking for Slices short name and description. Enter them and click on Create slice button. You may also specify time zone. Slice information - you can change these detailed settings by clicking on Edit link on top right corner. 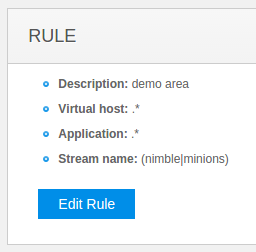 Rule for defining streams names. Name and description - which you previously entered to identify the slice. Show servers details for users defines if end-users (who we will assign to this slice later) are allowed to see details about servers which send their data to this slice. Billing details - they are used in Billing feature set. Then you need to assign servers to the slice. This is how you define which servers will be sending information to this slice. You need to add them from the list of servers available in the system. 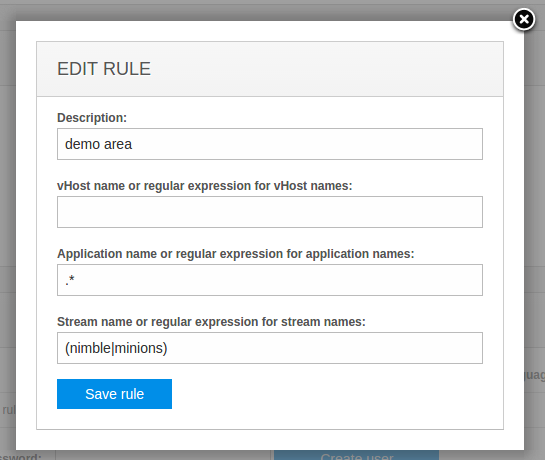 The next step is to define a rule with the regular expression for the streams and applications which you would like to track. Each expression may cover any number of streams or apps. So learn more about regexes and set up what you like. 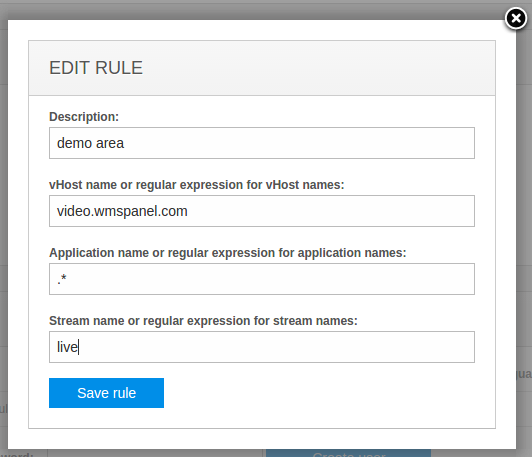 Adding rule for a stream. Specifying domain for collecting its data. Then you need to assign new or existing users to the slice. Please read this blog post for detailed description. So now you're all set. Having this slice you can switch to it and see what's going on with your stream. You can set up white label branded panels and create accounts for your clients so they could see these statistics too. All end-user experience related features can be used with streamed slices. Notice that streamed slices are eligible for subscription payments. Please refer to our full prices page for details. We recommend using lite slices as their reduced functionality is mostly covered with streamed slices capabilities hence they are half the price from the original full slices. Please contact sales for enabling this pricing option. To see this in action you need to make a sign up to try our panel. That's a ridiculously expensive price. I have something like 30 webcams and the price of this addon would be 4 times what I pay for Wowza itself. And that's with the lite slice. Initially the slice is the way our customer exposes his data to his clients. This brings some added value hence it might be eligible for extra payment. We'll also soon add ability to disable geo reporting for any slice so you may have full default slice with geo reporting to see overall picture of your streaming assets, while having small cheap slices for individual app or stream. Webcams may also be tracked via Active streams report which has total connections, traffic and bandwidth for last 24 hours. And yes, for some cases our solution might cost more than you pay for Wowza licences. But any additional software you may buy or develop yourself would also cost something so the question is about features vs. cost of ownership ratio.